Till the early eighteenth century the Kind of Sikkim ruled Darjeeling and lost Darjeeling to the Gorkhas. Later British invaded Darjeeling and made the city their Summer Capital and developed Darjeeling as a major tourist spot in Himalaya and hub of the finest tea production centre in the world. Ultimately Darjeeling has become the “ queen of the Himalaya”. ​Darjeeling is thought to be derived from the word Dorjeeling, which literally means 'the place of Dorjee' the majestic thunderbolt. The unchallenged queen of the Himalayas , Darjeeling always attracts people from all over the world. Darjeeling located in eastern-himalaya is 80 kms from Siliguri town and takes approx 3 hrs to reach. 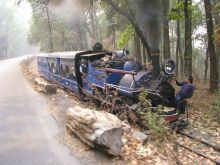 But if someone wants to enjoy the real beauty of journey and has time in hand should take Toy Train ride from Siliguri. The toy train is popularly known as Darjeeling Himalayan Railways or DHR. The toy train approximately takes 8 hrs to reach ( Guiness Railway Book referred to this train journey as one of the most spectacular in the world). Anyone can experience the engineering excellence of the train route. The valleys, lush green forests and tea gardens never give you any chance to look into the other thing while traveling to Darjeeling from Siliguri and no one feel boring as the beauty of the road never provide any chance to do so. The omnipresence of mighty Kanchenjunga Peak ( 3rd highest peak in the world) is felt everywhere in this hill station. 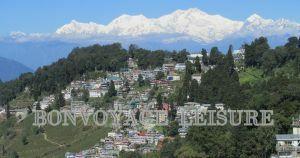 Some parts of Darjeeling can be visited by walking and for the rests to be by vehicles. If anyone doesn’t want to go anywhere then just roam around the city to enjoy the local traditional and modern culture or simply sit in the Darjeeling Mall ( Chowrasta) to relax. Because of the picture perfect beauty, trekking trails and awesome mountain views of Darjeeling , people flock in Darjeeling to escape the heat and humidity of the plains and beat the stress of city life. Who has the interest in Botany or simply want to see the variety of orchids, cactus or different kind of trees then Darjeeling botanical garden or Lloyd Botanical Garden is the ideal place to visit. Mahakal Temple or Darjeeling Observatory Hill and Shrubbery Park are also places to visit. Two major kinds of forests are present in Darjeeling Hills. Upto 6000 ft. is tropical & above from 6000 ft. upto 12,000 ft. is temperate. Darjeeling is a paradise for Bird Watchers. In Darjeeling Zoo anyone can see the one of the most endangered species of the world – Red Panda. Darjeeling weather resembles European nature. Darjeeling is always cold. Even in May-June, you require woolen clothing after the evening. Day time is comfortable. But from October onwards and up to March you require heavy woolen clothing. Location of Darjeeling is unique. The city located on the West bengal, Sikkim and Nepal border. Bonvoyage Leisure has designed and arranged Darjeeling tour packages under Darjeeling holidays along with local sightseeing, in and around Darjeeling tour, Darjeeling tourists attractions, hotel bookings, transport booking etc. All kinds of hotel and resorts booking ie., Standard hotels, deluxe hotels, luxury hotels are booked under Darjeeling holiday packages . Tiger Hill !! Ghoom Monastery ( Yiga- Choling Monastery) !! Batasia Loop & War Memorial !! Himalayan Mountaineering Institure ( HMI) !! Padmaja Naidu Himalayan Zoological Park !! Tibetan Refugee Self Help Centre !! Japanese Temple & Peace Pagoda !! Tenzing & Gombu Rock !! Ava Art Gallery !! Lloyd Botanical Garden !! Dhirdam Temple !! Rocak Garden & Gangamaiya Park !! Shrubbery Park !! Mall ( Chowrasta) !! Observatory Hill !! Happy Valley Tea Garden ! !